Browse current real estate between $600k-$800k for sale in the Upper Valley region of New Hampshire and Vermont. Contact us if you are interested in touring one of the Upper Valley listings below. Sign up with our website to save your favorite listings, and we can send up email updates when new properties match your search criteria. This historic cape was moved to this site, set well back form the road and lovingly restored by a Lyme master builder/craftsman. This 3+ bedroom home has the original charm of wide pine floors, hand hewn beams, raised panel doors, beautiful windows, a private ground floor master suite with marble bath and walk-in closet . There is a ground floor butternut paneled office with fireplace, ground floor laundry room, and the kitchen/family room opens onto a huge stone patio in a peaceful backyard. Second floor has a large en suite bedroom with fireplace, plus another bedroom and bath and a third room with closet. Easy access to both Hanover and Lyme, enjoy this tranquil beauty. Built in 2016, this three bedroom home is nicely sited on 2.2 acres with a barn. It was designed with passive solar gain and energy efficiency in mind with oversized windows and great attention to insulation. Appearing much bigger than its 2000 square feet with vaulted ceilings on the second floor and ten foot ceilings on the first floor, its one of the smartest designs we've seen in a long time. Enjoy a custom kitchen with beautiful cabinets and quartz counter tops with a waterfall peninsula, walk-in closets, solid hickory floors, built in desks, nightstands, new septic and drilled well. This is a super opportunity to purchase a recently completed contemporary design home with lovely privacy just 11 minutes to Dartmouth and 14 minutes to DHMC. Fall in love with the stunning views that surround this home, as well as the sunlight that floods in. This custom built home sits on 35 acres, surrounded by hillsides that maintain privacy and a sense of seclusion. The bright kitchen is a dream, featuring stainless steel appliances, and island for additional seating. Spacious bonus room off the kitchen provides easy access to laundry, as well as ample storage. Open to both the kitchen and living room, the dining room is ideal for entertaining and features a gas-fireplace and ample windows for natural light. All four bedrooms feature stunning views, but the master serves as an oasis retreat. Ample windows, a private patio, and spa-like bath make the master the ideal spot to retreat to after a long day. The in law apartment with separate entry provides a secluded sleeping area, or offers rental income potential. The many closets allow for organization, and the garage, barn, and shed provide ample storage. Relax and take in the mountain views and stunning sunsets from one of the 2 patios and 2 decks featured in this home. You do not want to miss out on this meticulous home, schedule a showing today! Fabulous 4 bedroom, 4 bath cape with 2 fireplaces, in the beautiful Bragg Hill section of Norwich. First floor has gorgeous hardwood floors, large mudroom, large kitchen, dining room, living room with fireplace, family room and full bath. Great patio. Second floor has two master bedroom suites, (one with a fireplace), 2 additional bedrooms, laundry and 3 bathrooms. A spacious home in a super spot! 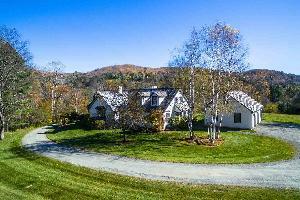 Private location yet less than five minutes from VT Route 113! Mountain View of Vershire has been run as a Level III Residential Care Facility for almost 20 years. It is in process of closing down as the owner has decided to retire. This 8 bedroom/3 bath home has loads of glass to soak in the breathtaking views from every window! The home boasts a wonderful eat in kitchen, a cozy sunroom, spacious dining room and living room with handsome brick hearth and wood burning fireplace, and lower recreation room with walk out to enjoy in the beautiful yard! New standing seam metal roof, 2 car attached garage, full house generator, convenient "stair chair" system, state of the art fire alarm with emergency sprinkler system, and security system! Use this property as a nursing home or to do something totally different! It could be a great short term rental property, B&B or gorgeous location to hold events. The property affords immediate access to snowmobiling trails and wonderful open land for gardening or relaxing with a good book in the summer months! This property could be used as a residential or commercial property as there is no zoning in Vershire. Come check out this opportunity today! The views are absolutely amazing! Explore the different options of what you can do here! Rural spot yet easy access to the highway, 30 minutes to Hanover, NH & Dartmouth Hospital! WHAT A PLACE FOR A VACATION RETREAT OR RENTAL INVESTMENT PROPERTY! ENJOY AMAZING MOUNTAIN VIEWS FROM THIS GORGEOUS SPOT IN BEAUTIFUL VERSHIRE! 10 ACRES OF OPEN LAND AND DIRECT ACCESS TO VAST SNOWMOBILING TRAILS! This 8 bedroom/3 bath contemporary home has loads of glass to soak in the breathtaking views from every window! The home boasts a wonderful eat in kitchen, a cozy sunroom, spacious dining room and living room with handsome brick hearth and wood burning fireplace, and lower recreation room with walk out to play in the yard! New standing seam metal roof, 2 car attached garage, full house generator, state of the art fire alarm and security system! Loads of potential here to use this property as your own or rent it out for short term vacation rentals! Take your snowmobile right from the door to the trails, enjoy the open land for gardening or relaxing with a good book! This property could be used as a residential or commercial property. Come check out this opportunity today, it wont last long on market with that view! Private location yet easy access to the highway, 30 minutes to Hanover, NH & Dartmouth Hospital! Charming contemporary farmhouse designed with whimsy and delight on 5.78A with 850ft +/- of Connecticut River frontage. End of road location with lots of southern light and plenty of water views. A detached 3 car garage with 1 bedroom in-law apartment for extra living space. Downstairs master bedroom, wood floors, finished lower level. There are 1-2 fenced open acres for more gardens and animals. Beautiful, established gardens that include berries and asparagus plants. The natural world abounds within this very special property. Approximately 15 minutes up to Norwich/Hanover area. Hartland, is a small quintessential Vermont town with a charming town center. School choice is available from 9-12. Location, location, location! This in-town brick ranch offers a lovely floor plan within walking distance to Main Street. Sunlit living room and dining room combo with lovely woodfloors and a fireplace. Huge upgraded kitchen opens to a sunporch and out to a private deck. Master suite and two other bedrooms on main level. Family room and additional bedroom on lower level. Two car garage, great side yard - in a neighborhood of some of Hanover's nicest houses!